As a professional wheel loader manufacturer in China, we can provide a wide range of loading machines to meet the requirements of customers. Our loaders are manufactured in accordance with ISO9001:2008 standard. They are equipped with high quality engine and are characterized by high cost performance ratio, reliable performance, and high efficiency, etc. For more details about them, please refer to the following descriptions. 1.1 These wheel loaders are equipped with reliable Cummins engine. 1.3 The construction machinery is fitted with combined seal cylinder which can offer good sealing performance and high reliability. 1.4 ZL50H, ZL60H and ZL75H scoop loaders are provided with bucket automatic leveling ability. 1.5 ZL60H and ZL75H loaders are equipped with KD switch to ensure high efficiency and easy operation. 1.6 They are also fitted with reliable ZF transmission case and torque converter. 1.7 To ensure maximum traction, ZL75H wheel loader is fitted with famous original ZF wet-type drive axles and ZL60H loader is fitted with GRAZIANO wet type drive axle with multi-disc brake and limited-slip differentials. 1.8 Dual brake valve, dual pipe full hydraulic brake and central lubrication for ZL75H loader. 1.9 Shangchai C6121 engine is also available for ZL50H& ZL60H wheel loader. 1.10 Bale grappler, fork, ROPS frame, side-dump bucket, snowplow and some other accessories are also available. 2.1 These wheel loaders are fitted with high quality Chinese engine. 2.2 Their hydraulic oil tank enjoys good leakage-proof performance, thus effectively preventing the oil from leaking and ensuring the cleanness of oil. 2.3 These wheel loaders are highly efficient. For ZLM955 and ZLM40E loaders, the work time for a single working cycle is 11.8s, and for ZLM30E loader, the time is 9.2s. 2.4 The engine hood is turnover, which provides convenience for maintenance and repair. 2.5 Bale grappler, fork, ROPS frame, side-dump bucket, snowplow and some other accessories are optional. 2.6 The construction machinery has high cost performance ratio. 3.1.1 This loader uses Weichai engine, ensuring strong power and low fuel consumption. 3.1.2 HANGCHI power-shift gearbox and single-stage 4-element hydraulic torque converter can automatically adjust the output torque. 3.1.3 The skip loader is fitted with Meritor driving axle which is of high reliability and is convenient to repair and maintain. 3.1.4 It is highly efficient. Its total three item work time is less than 11.5s. 3.1.5 Bale grappler, fork, ROPS frame, and air conditioner for cabin are optional. 3.1.6 This wheel loader has high cost performance ratio. 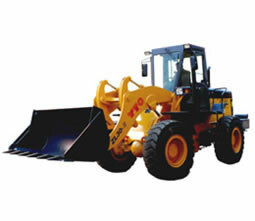 3.2.1 This front loader uses YTO LR6B3-22 engine which can offer strong power and is energy saving. 3.2.2 Due to its torque-varied oil heat radiator and water radiator, it can dissipate heat efficiently. This makes it suitable for heavy-load and high temperature working environment. 3.2.3 This loader is highly efficient. The total three item work time is less than 12s. 4.1.1 This payloader is equipped with YTO LR6B3-22 engine which can offer good motive power and consume less fuel. 4.1.2 It is fitted with fully hydraulic steering device which is easy to operate. The steering radius is small. 4.1.3 Joy-stick control, ROPS frame, air conditioner for cabin and some other accessories are optional. 4.1.4 The machine has high cost performance ratio. 4.2.1 This wheel loader is usually fitted with Weichai engine which can offer strong power and consumes less fuel. Furthermore, CUMMINS or SHANGHAI D6114 engine is optional. 4.2.2 Power-shift gearbox and single-stage 4-element hydraulic torque converter can automatically adjust the output torque. 4.2.3 Joy-stick control, ROPS frame, air conditioner for cabin and some other accessories are optional. 4.2.4 The machine has high cost performance ratio. Additionally, we also offer wheeled tractor, forklift truck, rotary drilling rig, etc.